If you’ve ever parked your car in a hurry and then completely forgotten where you left it just hours later, then fear not, because technology is here to save the day. Google has updated its Now app for Android with a new feature that will deem your short term memory completely redundant next time you’re driving out and about, because it remembers where you’ve parked your car for you. 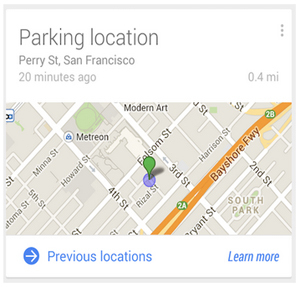 According to Google, the Google Now app uses the sensors in your phone to work out when you’ve left a moving vehicle. It’ll then serve up a “parking card” to ensure you remember the exact location, which means you could get one when you step out of a friend’s car or a bus, but they can be dismissed – or removed entirely if you don’t drive. Other changes to Google Now include an updated reminders features and added voice support for some more of its settings.